Hey smart mommies ! Here i am the sharing the procedure to make the oil to use for your after delivery massage. Mine was normal delivery and I was in mom’s place after delivery. My achi(mom’s mother) stays with my sister then came to look after me and stayed with me for 1 month and completely took care of me and my baby boy(Grishyanth Abhimanyu) after delivery. My baby boy used to wake up around 9 am in morning. So, before he wakes up I used to complete my morning chores like having body massage, bathing and having breakfast. My achi(grandmother) herself used to prepare oil to use for your after delivery massage. Before bathing my achi used to massage me with the oil from toe to top for nearly 10 mins. Here I am sharing the benefits and the procedure for preparing the massage oil. Since I had a normal delivery, I started with oil massage as soon as I was back home that is after 4 days. 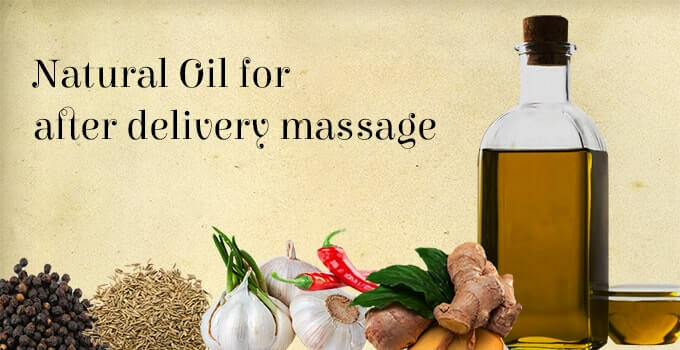 Oil massage should be taken on alternate days for 4-6 weeks after delivery.Take hot water bath after the massage. Before starting oil massage keep in mind to check for any allergic reactions. My strong advice is to do a patch test if you have never used the oil before. Another important factor is to consider the climate because each oil has its own property like either they are cool or hot. Gingelly oil (1 cup)- antioxidant and anti-inflammatory properties of gingelly oil help to reduce inflammation within and outside your body which ultimately results in improved blood circulation. Ginger(1 small piece)-The antioxidant property of ginger helps to protect your body from free radical damage. Cumin seeds(1 tsp)-Cumin seeds have disinfectant and anti-fungal properties which protect your skin from fungal and microbial infections. Garlic( 4 to 5 cloves)- helps reducing inflammation in your body. First heat gingelly oil in a pan. Once the oil starts to heat add pepper, cumin seeds and allow it to splutter. Now add ginger, garlic and lower the flame of the stove. Now once the oil bubbles up switch off the flame and then add chilly. Allow it to cool and now oil to use for your after delivery massage is ready. Improves blood circulation- oil massage helps to expand the blood vessels, which in turn improves blood circulation. Relaxation– Oil massage helps to relax your body and relieves tension in strained muscles during delivery. Ease -Helps to ease your back, hip and waist area and ensures that your lower body gains strength. Reduce swelling- The increase in blood circulation helps to eliminate excess fluids and waste products from the body. Improves breast milk-Helps to increase production of oxytocin hormone levels which will result in better breast milk flow. So after a relaxing oil massage take bath using hot water(Click here to read about the hot water bath method) and then have your breakfast(Click here to read about the foods to eat after your delivery).